This image taken on June 5, 2008 shows the Robotic Arm scoop containing a soil sample poised over the partially open door of the Thermal and Evolved-Gas Analyzer's number four cell, or oven. Light-colored clods of material on the scoop's lower edge may be part of the crusted surface material seen previously near the foot of the lander. NASA'sPhoenix Mars Lander successfully scooped up a sample of Martian soil with itsrobotic arm, mission scientists said on Friday. The scoopis poised and ready to deliver the sample to an instrument on thespacecraft that will analyze the soil. "Thisis really an important occasion for us, to be poised to make a measurement forthe first time of the Martian arctic soil," said Phoenix principalinvestigator Peter Smith of the University of Arizona. The $420million mission aims to dig down through the soil to the layers of water ice thoughtto lie underneath the surface, and to analyze soil samples to determine theircomposition and see if the ice might once have been liquid water, potentiallycreating a habitable zone for microbial life at some point in the past. Phoenix retrieved its sample Thursday froma site dubbed BabyBear, which lies just to the right of the trench the lander dug out in itspractice digs. The practice digging locale is called Dodo. 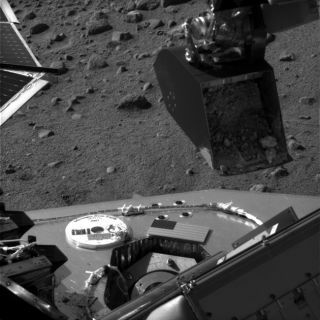 ?After scooping upthe sample, measuring about 1 cup in volume, Phoenix used its robotic armcamera to photographthe sample so that scientists could make sure they had enough to deliver tothe Thermal and Evolved-Gas Analyzer (TEGA) instrument aboard the lander. "Thislooks like a really good sample for us," Smith said. Mission controllers will send instructionsto the lander to dump the sample into one of the TEGA ovens tonight. The TEGAovens, which are about an inch long and the diameter of a pencil lead, willheat up the soil samples and use a mass spectrometer to detect the gases thatcome off the samples, which will shed light on some of the materials in thesoil, specifically those formed by the process of liquid water. "TheTEGA system is particularly sensitive to water in its oven ? water is the firstthing that's cooked out," Smith said. Mission scientists must be careful whendelivering the sample not to overload the instrument and contaminate otherovens. Once the sample is delivered on Friday, Phoenix will image TEGA to makesure the sample has been delivered and that the oven door is shut. Theinstrument is will then begin its four-day analysis (which may not occur infour consecutive days); the team will report each day's results as they becomeavailable. Any water present in the sample should be the first thing tovaporize from the soil, Smith said. The samplealso contains some of the white material seen in the scoop after Phoenix's first practice "dig and dump," which scientists think could be ice or atype of salt mineral. Of course,they can't be sure that any of the white material will make it through theoven's entry screen. "We're hoping that some of this goes in and that weget a hint of what it is," Smith said. Somescience team members think that the whitish material can't be ice because ithas been too easy to scrape up ? the ice layers under the soil will likely bedifficult to scrap because ice is so hard at the brutally frigid temperatureson Mars (which have so far reached a high of only -22 degrees Fahrenheit (-30Celsius) since Phoenixlanded). "Somepeople think that it's too easy to get this material and that it can't be ice,"Smith said. But he added that if the white material turns out to be some kindof salt, "that would be a very nice discovery" because salts are whatis left when water reacts with soil. After TEGAbegins its analysis, the lander will start digging up samples for itsmicroscopes and its wet chemistry lab. The microscope samples will likely betaken from the same Baby Bear site as the TEGA samples, because they will shefurther light on TEGA's results. The wet chemistry samples will be taken froman adjacent site just to the right of Baby Bear, dubbed Mama Bear. "If wehave a really good week [next week], we could have each of those delivered bythe end of the week," Smith said.